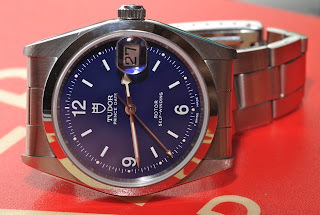 It has been a while since I last did a review on a watch. I will try to change this and will do more watch reviews. 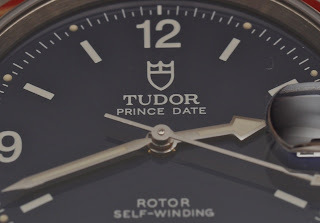 Today we are looking at the Tudor reference 74000 Prince Date watch. I have no idea when this watch was introduced into the market but this example was purchased in 1996. 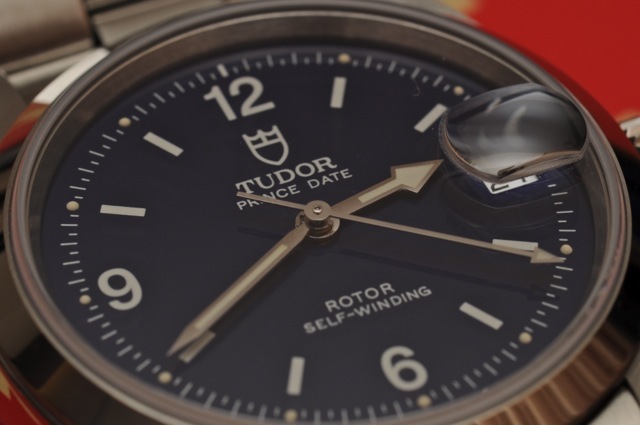 The watch is a basic Tudor offering time telling and date complication. 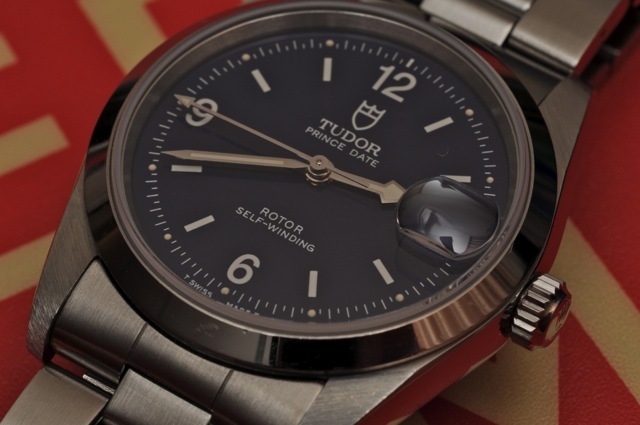 As with all watches in the Tudor range, the case is made from 316L stainless steel. The case is well made and is of the 3-piece design, i.e. bezel, case and case back. The watch is small at 34 mm in diameter and 10.5 mm thick (at extreme and 9.5 mm without the Cyclops). The case has the traditional Tudor/ Rolex trademark polished sides and brushed top. I like the older case design with the drill lugs that this watch has. The bezel is plain and it is also polished. 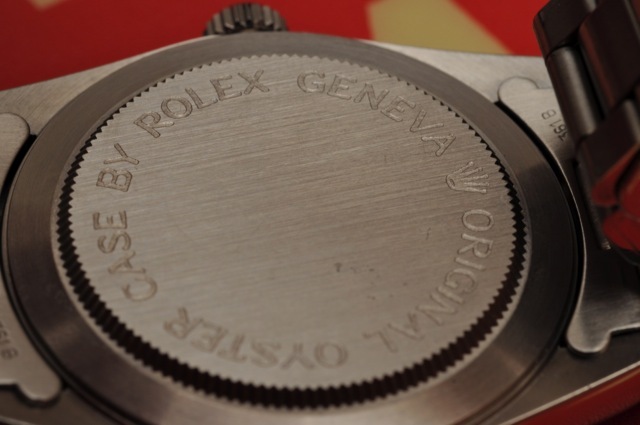 As this watch was from the old days, the case back carries the older ‘Original Oyster Case By Rolex Geneva’ engraved on it. It also has the Rolex crown. The case back has a brushed finished and the traditional Rolex case back serrations for case back opening. The crown, as is the case back has the Rolex crown. The crown measures 5 mm in diameter and is 2.5 mm thick. It is a nice size and using it is a breeze. Nice size crown for the watch. 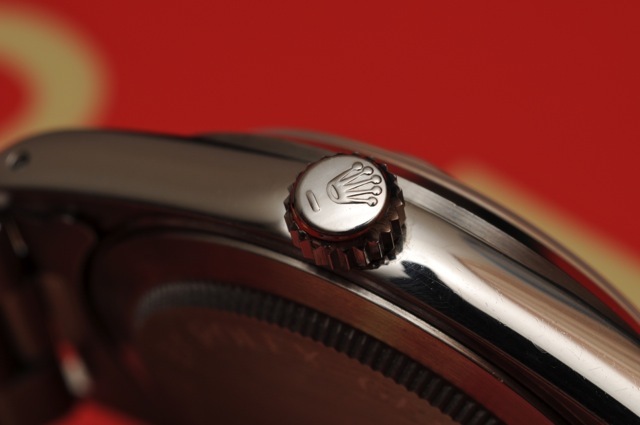 The crown is of the Twin-lock design (line under the crown), which means the watch is water resistant to between 5 to 10ATM. 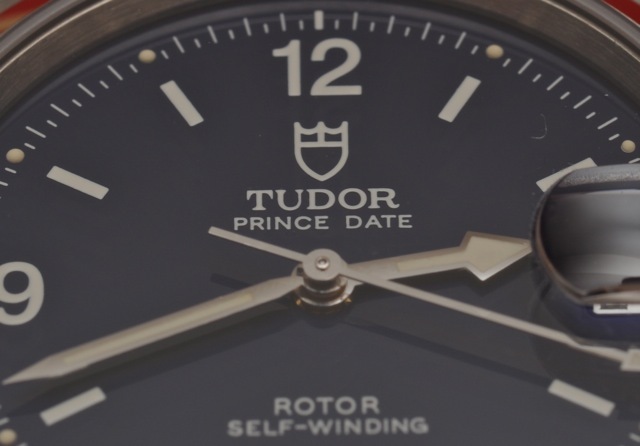 As with other Tudors and Rolexes, the model number and serial numbers are engraved between the lugs, which are 19 mm apart. This makes using independent straps difficult (but not impossible). The watch has an interesting dial colour and design. 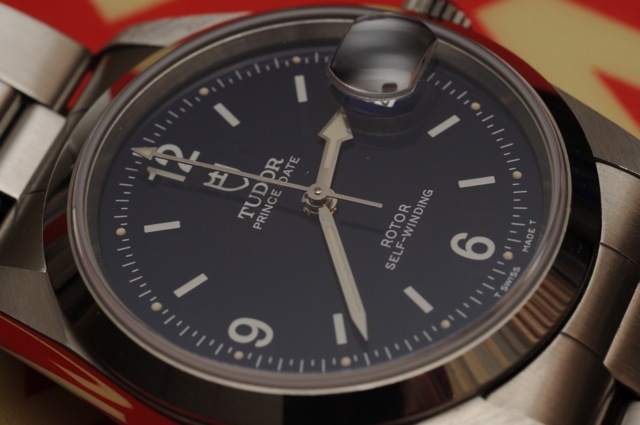 It has the Explorer type dial with the 12, 6 and 9 Arabic numeral hour markers. The baton hour markers mark the rest of the hours. I like the design of the dial. The other markings on the dial are the minute markers and the half-minute markers. The half-minute markers are shorter than the minute markers. Although it looks like there are lots of markers and may make the dial look busy, the markers are big enough to see but small enough as not to clutter the dial. At the 12 o’clock position we find the Tudor crest and signature. Under it we find the legend ‘Prince Date’ telling us this is a men’s model and it has the date complication (at the 3 o’clock position). Below the 6 o’clock hour marker we find the legend ‘T Swiss Made T’ which tells us the watch is Swiss made and the luminous material used is Tritium. The luminosity is long gone as the dial has tritium as the luminous material. The Arabic numerals and the batons are not luminous. The are little dots on the minute markers that are luminous. A nice patina has already developed on the markers. The other interesting aspect of the dial is the dial colour. It is actually blue in colour but it is very difficult to capture. It can look black under certain light condition. 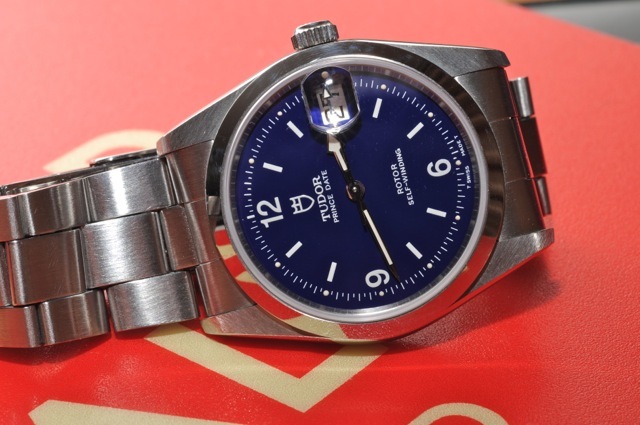 In fact in most situations, the dial looks a deep blue. The date is displayed via a window at the 3 o’clock position. The date wheel is black on silver and it is very easy to read (assisted by the Cyclops). The watch has the Tudor Ranger type hands. That is another reason the watch is special (to me). I got the watch because of the dial and hands design. 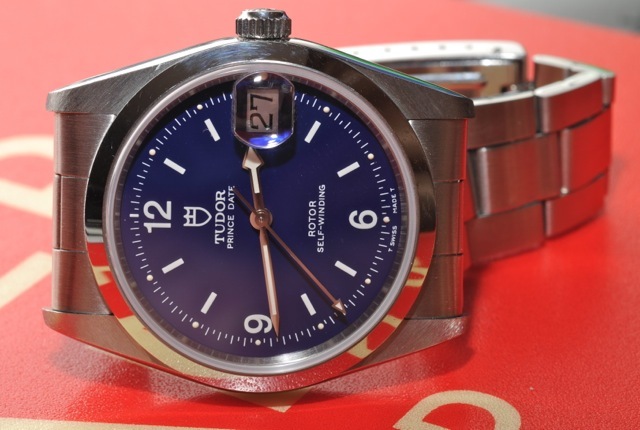 As with the dial, the hands are Tritium filled and the luminosity is also long gone. 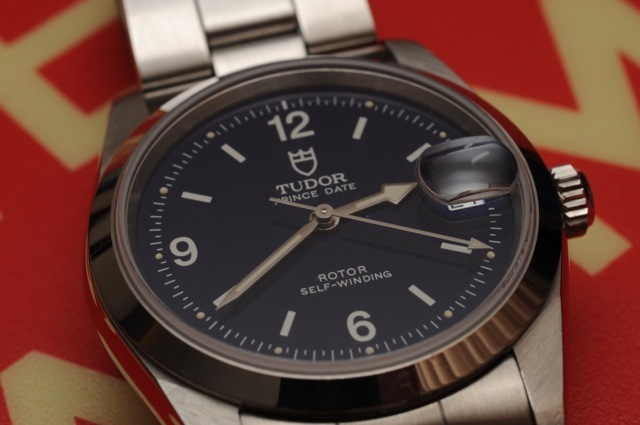 The sweep seconds hand has an arrow tip that is Tritium filled. The hands are well made and do not show any signs of Tritium corrosion common on Tritium filled hands. 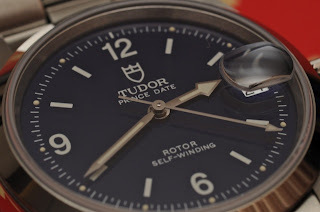 I hope it does not occur on these hands, as I do not know if Tudor has replacement hands and I do not want to change the hands to the Luminova filled hands. The sweep seconds hand extends all the way to the minute markers but the minute hand does not. It just touches the minute markers. While it would be nice if the minute does extend to the minute markers, but in this case, I think it is better that it does not. The watch is fitted with a sapphire crystal and has the Cyclops over the date window. The Cyclops is 1 mm thick. The crystal itself is 29 mm in diameter. The crystal does extend beyond the bezel by about 1 mm but this is not an issue as the crystal is sapphire and is scratch resistant. The crystal was replaced in the last service. 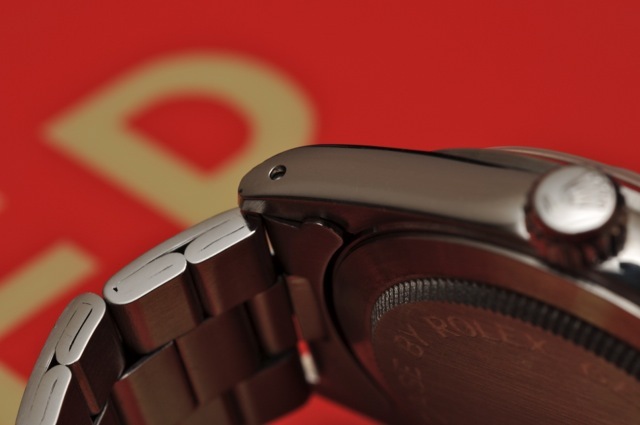 The watch has the older folded metal bracelet and the hollow end links. The bracelet reference 7835B has a brushed finish and for a watch that is 16 years old does not show much stretch. The end links, reference 361B also has the same brushed finish and is well made. It sits well between the lugs and has a ‘closed’ design, i.e. no gaps to facilitate the spring bars removal. Removal of the spring bars is via the drilled lugholes on the lugs. The buckle, reference 7835B is made of steel inox and is also well made. I like the older type buckle and bracelets but the problem is the adjustment of the bracelet to fit the wrist. 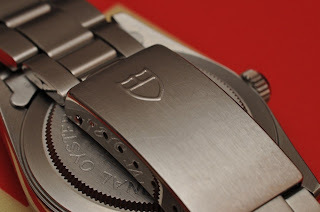 Adjustment is via adjustment holes on the folding buckle. There are 7 adjustment holes and allows the bracelet to be adjusted by 21 mm in length. 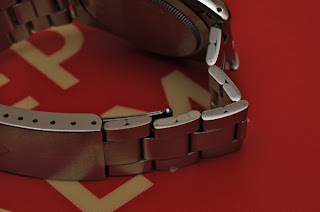 If there is a need to adjust the bracelet longer or shorter, there is a need to physically alter the length of the bracelet by removing or adding links. And this has to be carried out at the service centre. 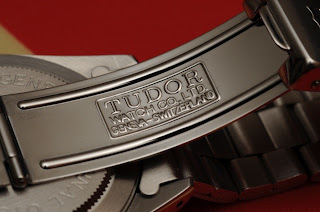 The folded part of the buckle is polished and is signed 'Tudor Watch Co. Ltd. Geneva Switzerland'. It is thin but does the job and does it well. I got this watch for myself but it has since been given to my wife. It is a very comfortable watch, not heavy but enough heft. When I was wearing it, I found the watch very comfortable and had no issues with the bracelet, which is a sore point with many collectors of Rolex and Tudor. 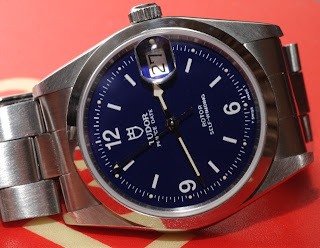 I do understand why it took Rolex and Tudor a long time to change or improve on the bracelet and buckle design. The watch is easy to read and tell time and date. 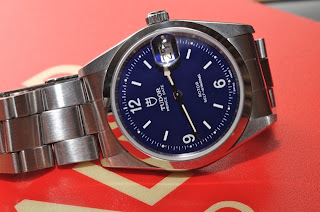 It is not flashy and at 34 mm it does go against the current trend of large watches. But since it is all dial, it does not look small at all on the wrist. Hello Ivan, may I know how much did you pay for this watch?